"The Living Mummies Of Toth-Ra!" 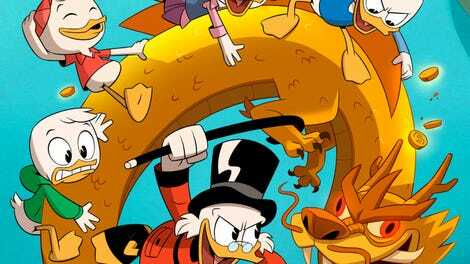 DuckTales has an appealing, eclectic cast of characters, but it struggles to focus them through a strong, viable narrative that either provides real, consistent stakes, or props up the more-comedic sensibility of the show. The strongest theme has usually been the familial dynamic, but it has only been trotted out occasionally; only Donald Duck feeld truly informed by it. But “The Living Mummies Of Toth-Ra” has all of that and then some–the culmination of the various character developments (barring a delayed Huey-focused episode), strong comic beats, a mysterious, intriguing story, and the kind of engaging fun that has felt missing from the show so far. After another Launchpad crash-landing–the show is determined to make this a great running gag–we find Scrooge, Launchpad, Webby, Huey, Dewey, and Louie in the center of a pyramid, the crew on a real adventure for maybe the first time since the pilot. Their exploration is cut short as they stumble down deeper into the tombs and discover an entire civilization of jackal-and-owl people, a society dressed in fresh bandages (in lieu of pay) and blindly worshiping Toth-Ra–or, more accurately, a fake-idol of him. Even at the onset, it’s clear that this thing is a fraud, but it has the people blindly following him and his orders for only occasional moments of sunlight. More disturbing than the fraught image of a mummy-god enacting his control is a society so calmly and obliviously accepting those scant rewards for being true believers. DuckTales mines a lot of humor from this situation: merchants and scammers hocking sand, Amunet dismissing Scrooge’s and Huey’s observations, a parent covering their child’s ear from the ducks’ blasphemy. But make no mistake: this is a deeply oppressed society that has for centuries internalized their situation into something positive. “The Living Mummies of Toth-Ra” gets it charm primarily by allowing its characters to thrive in their perspectives perfectly. Falling into the pyramid, Louie and Webby get separated from the rest, but each character has a moment to “be” themselves without disrupting the flow of the episode too much. Louie plays hard into his (poor) ability to talk his way out of anything, which works mostly as a stalling tactic. Webby uses her knowledge of ancient lore to discover secret passages, distract Toth-Ra’s servant, and maintain a general knowledge of what’s going on. In the society end of things, Scrooge takes control of rousing the people into an army, his take-charge personality butting up against the ignorance and naiveté of the people. Dewey tries to push his desire of seeing real mummies as a training method, teaching everyone to moan and act like lumbering, wrapped zombies. Huey pushes for real, planned strategic attacks, despite constant pushback from Amunet. Even Launchpad gets involved for the first time, although his lessons on how to pack large-sized burritos seem quite superfluous. What this all leads to is a fairly wild third act. Everything that has been set up gets thrown at the wall, a combination of frantic action and loony, comedic set pieces. At times, it feels a bit rushed, but the energy is infectious. Louie and Webby’s arguments are generic but cross in a way in which both have their failures and victories, exposing the fake-Toth-Ra (literal!) pyramid scheme. It then leads to the prophecy coming true, the real Toth-Ra possessing the fake one, reeking havoc inside the chamber. A lot of this fight consists of comic payoffs (and fallouts) from all the beats from earlier, like Amunet’s comment about Toth-Ra’s laser eyes and beetle spies, and Dewey’s pointless Thriller training being an obvious bad idea. But they feel part of the climax regardless, and their implosions don’t hinder the highs, like Scrooge straight-up manhandling (duckhandling?) 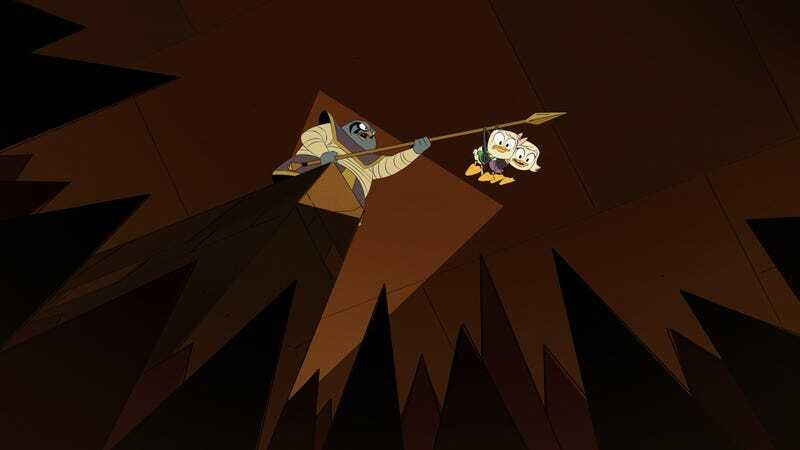 Toth-Ra, or Launchpad’s burrito-making skills keeping Toth-Ra captured just long enough to carry him back over the cursed threshold, or Webby and Louie indirectly working together to stop him once and for all. It’s a third act that feels cohesive and complete, the sillier bits part of the story instead of an aside to it. With the comedy, characters, and action at the show’s peak, the only thing that the show needs to tweak is its sense of pathos, the dramatic twinge that could elevate the show just a few more notches. There’s something a bit disingenuous in how this society rises up, overcomes, and fights for its freedom. Tying that pursuit to the desire for more burritos is a fine joke, but for a brief moment, Amunet makes it clear that acquiring those burritos was more symbolic, a literal taste for freedom, for choice, for autonomy. It’s a strong beat that the episode never quite follows through; when Amunet and her people are free, they simply line up for a taste of pseudo-Mexican food at a food truck. Likewise, the episodes places a lot of dramatic weight between Webby’s dark, academic knowledge and Louie’s immature, casual green. By the end, they apologize to each other and acknowledge how their inclinations are strengths (including the now-branded “pulling a Louie,”) but it feels tossed out real quick just to end that conflict. No matter. DuckTales is working on all cylinders with what it has developed so far; soon it’ll settle in that emotional place like the freed Toth-Ra worshippers in the outside world. Bassem Youssef voices Toth-Ra and Sabaf, who I think is the guard pretending to be Toth-Ra. Is this is first VO role for a cartoon? He nailed it. Cree Summer voices Amunet, who is just perfect as always. Cree is a veteran VO artist who is just a natural at this kind of thing. One thing that helps this episode is that even though there is an A and B story, it doesn’t feel like it, as both stories are simply two sides to one real adventure, and they both come together at the end. If I had to really get into it? I would shy away from A/B stories, and focus on one full tale that lasts the full twenty-two minutes. We’ve seen Webby work with Louie and Dewey, and both have been effective pairings. Webby and Louie work as contrasts of one another, while Webby and Dewey both have similar, passionate goals. I can easily see Webby and Huey working together as well, as they both seem dedicated to knowledge and clear information. Anyone get the sense that Louie is the show’s favorite? It’s not like he has more screen time statistically, but he seems to have more “pop” than Huey or Dewey does. I think it’s most likely due to Louie’s character being way more clearly defined than his brothers. I will say that Huey here feels clearer here than he did in “The Infernal Internship of Mark Beaks,” but Dewey still seems to a bit scattered. Some episodes he feels like off-shoot of Louie, sometimes he feels like that kid who just wants to prove himself, and sometimes he feels like a kid throwing out ideas confidently despite not knowing too much about anything (like here, whose idea of training the living mummies to act like “real” mummies–and then dancing “Thriller” mummies–is terrible). This all seems to add up to Dewey being someone who throws unearned confidence out to mask his insecurity, but it would be great to see that a bit more clearly. The Della Duck search would be perfect for that. As Louie humbles himself before the real Toth-Ra, the monster looks at him for a second before intoning, “Die.” It’s a blunt, cold moment, instantly raising the horror of it. Scrooge gets the best lines. His discouraged “This is the dumbest rebellion I have ever been a part of” his both hilarious and indicative of the crazy life this duck once lived. And his snap reluctance to pay for the food upon hearing the price is peak Scrooge McDuck, his “My money” quip the perfect capper.